Biennially held in Germany, Automechanika Frankfurt continues to be regarded as the world's most successful, trend-setting trade fair for the automotive and related sectors, and its 2014 edition again saw many exhibitors with innovative products. 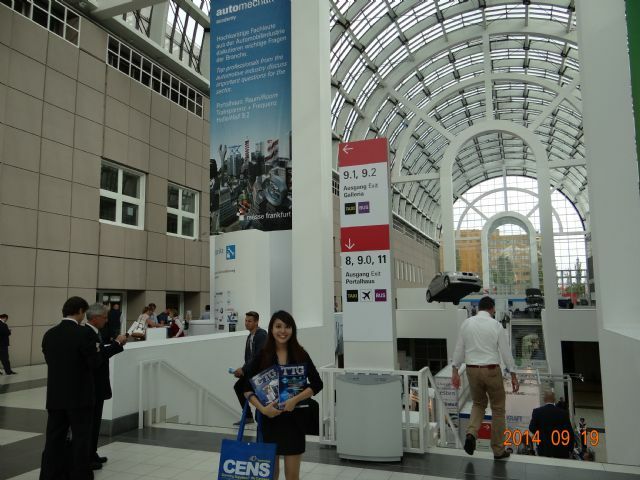 CENS' representatives at Automechanika Frankfurt 2014 held September 16-20. 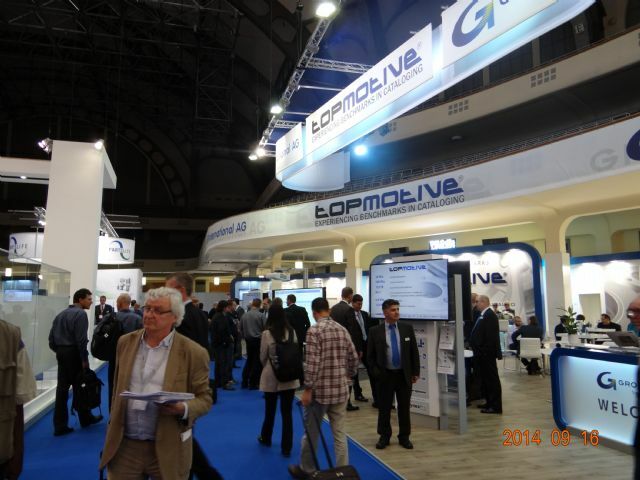 This year's Automechanika Frankfurt was held September 16-20 to occupy over 300,000 square meters, hosting 4,631 exhibitors from 71 nations, compared to 4,597 in the 2012 edition, according to statistics compiled by the organizer, Messe Frankfurt. The exhibitor number hit a record high, with China being the biggest participating country with 783 exhibitors, followed by Germany and Italy. 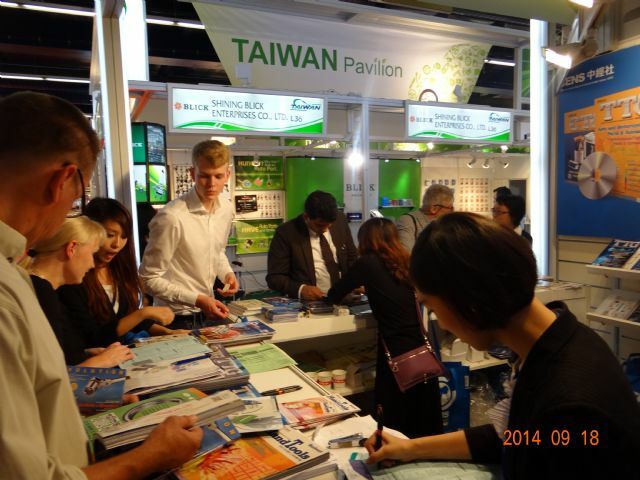 With 471 domestic exhibitors, Taiwan was the fourth-largest participant among other countries. “With a record 4,631 exhibitors, Automechanika continues to extend its lead as the world's most successful international B2B trade-fair brand,” said Detlef Braun, member of the Executive Board of Messe Frankfurt. 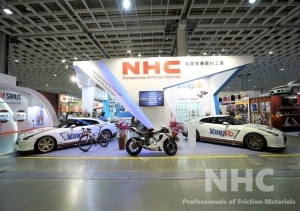 More than 4,600 exhibitors and 140,000 visitors worldwide take part. Over 140,000 visitors worldwide visited the event, according to the organizer's final report. 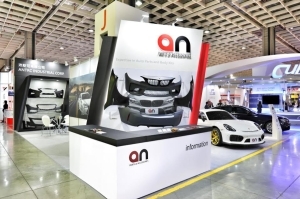 The encouraging turnout of exhibitors and visitors in 2014 reflects the continuing growth of the global automotive industry, as well as the vigorous automotive aftermarket, which industry observers say will continue throughout the year. 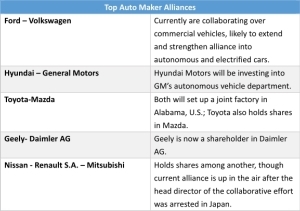 IHS Automotive, a global car market researcher, projects global demand for new cars to have reached 83 million units in 2013, and to further grow 3.6% to 85 million units in 2014. Mostly driven by strong demand in emerging countries, IHS Automotive predicts the figure to surge to 100 million units by 2018. 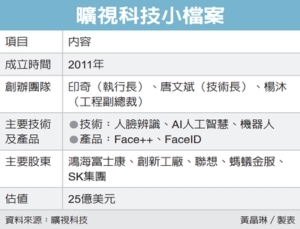 Meanwhile, Taiwan's Automotive Research & Testing Center (ARTC), a government-funded research institute, reported earlier that car production and sales in Europe both have steadily recovered, to 9.78 million and 9.27 million units, respectively, as of the end of H1, 2014, after declining to 18.66 million and 17.78 million units in 2013, compared to 19.83 million and 18.07 million units in 2012. 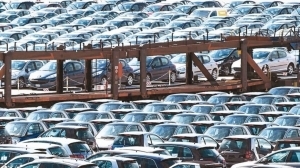 ARTC said that Germany, the U.K., France and Italy all witnessed car sales rise during the period, except Russia, where sales dropped 7.74% annually. 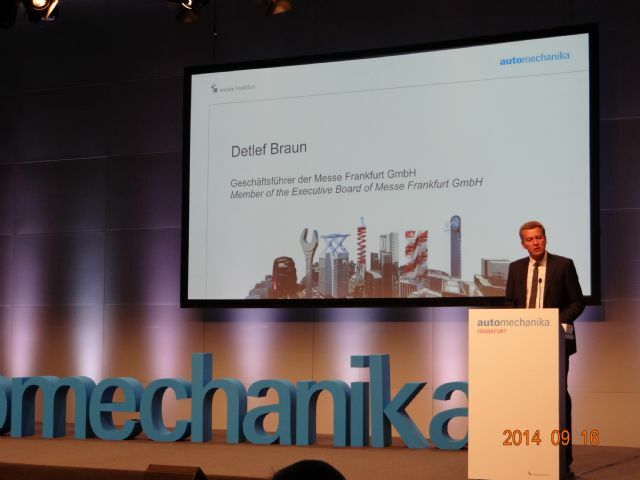 Detlef Braun, member of the Executive Board of Messe Frankfurt GmbH, speaks at the opening ceremony. While showcasing wide-ranging exhibits, the 2014 Automechanika Frankfurt also presented innovations and impressive future mobility issues to keep building its image as the world's trend-setting trade fair. Among the show's features, the Tomorrow's Mobility exhibition area brimmed of future mobility concepts materialized in various live vehicle demonstrations by 50 exhibitors, allowing visitors to try real-world experiences in smart, environmentally sustainable mobility that the global automotive industry is working on. 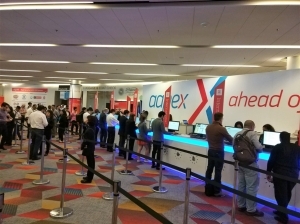 With zero emission, eco-friendly mobility issues continuously driving the trend towards electric vehicles, and continuing development of smart cities worldwide drawing attention to developing personal mobility vehicles, such vehicles and related products with innovative functions therefore were a big hit with visitors. Among those exhibits was the fleet solutions presented by GESPA (German Energy Service and Project Partner), a provider of complete systems for electro-mobility and renewable energies. The solution provides improved management support, such as GPS systems, for electric car fleets. Besides charging infrastructure and electric vehicles for households were also demonstrated to underline the provider's cutting-edge electric power generation and storage technologies. Electric vehicles in the "Tomorrow’s Mobility" zone. Also on display was the Mobile Kaffeebar by German-based Valentinas, an electric personal mobility vehicle with a sleek shape and futuristic exterior and lightweight structure that addresses power consumption. 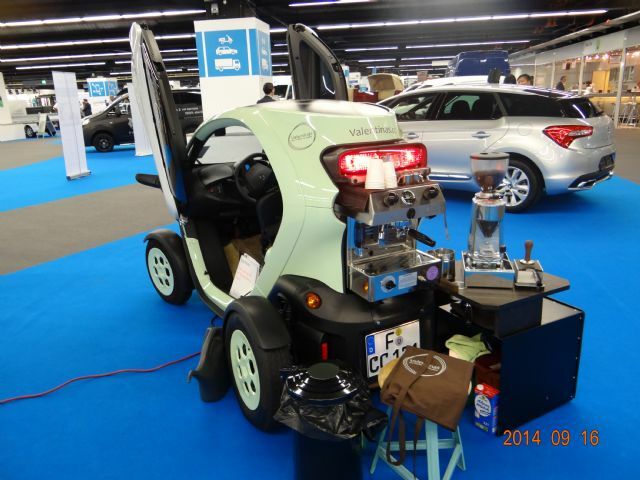 One feature of the vehicle's is the coffeemaker embedded at the rear, which works on electric power stored in the battery when the car is turned off, suggesting the firm's excellent battery and power storage technologies. Mobile Kaffeebar by Germany-based Valentinas in Hall 10. 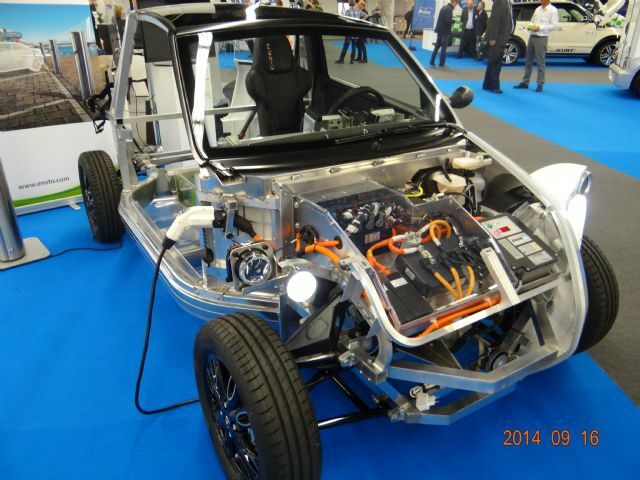 The Hamburg-based Karabag Group brought its ReeVOLT Transformation kit to Hall 10 to show visitors how easily a conventional car can be converted into an electric vehicle by garages with the conversion kit, composed of an electric motor, a control system, battery pack and an independent heating system. In addition to electric power, use of alternative fuel systems in vehicles also works to cut carbon emissions. Prins Autogassystemen BV, an alternative fuel system developer affiliated with SHV Energy, displayed its Direct LiquiMax System, an LPG (liquid petroleum gas) system applying direct LPG injection technology. Suitable for all Euro III and higher-class diesel engines, this fuel blend system turns diesel engines in trucks into dual-fuel engines by replacing a certain quantity of diesel by various combinations of LPG, CNC (compressed natural gas), LNG (liquid natural gas) and biogas, and without compromising drivability and performance, mostly thanks to its communicability with the ECUs (electronic control units) via the CAN (Controller Area Network)-bus to achieve injection of the correct amount of gas under computerized control. With ever more cars employing electronic components and systems for better monitoring of vehicle status, more comfortable and safer driving, and more diverse in-car entertainments, vehicle repair and maintenance are becoming ever more complex and time-consuming. 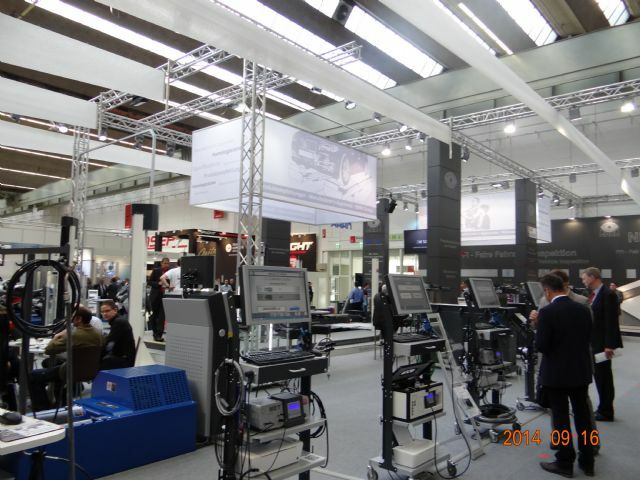 This transition is driving demand for more precise diagnostic tools and more efficient repair and maintenance solutions, and therefore has helped the sector of related equipment exhibitors at the Automechanika Frankfurt to pick up steam over the years. Some 926 exhibitors showed vehicle repair and maintenance equipment. Repair and maintenance equipment being the second-biggest category. An impressive exhibitor was Bosch, showcasing a thorough car service lineup that comprises various high-efficiency, high-precision equipment, including the HTD815 Digital Headlamp Tester noted for its built-in COMS camera to allow intelligent, fast and precise inspection of xenon, LED and halogen headlamps; the Bosch FWA9000 Non-Contact Wheel Alignment for fast simultaneous measurement of four wheels with exacting accuracy with laser and 3D stereo cameras; and ACS 752 Connection Pack, a fully automatic repair and maintenance unit for air conditioning systems in both hybrid and electric vehicles; and many others. 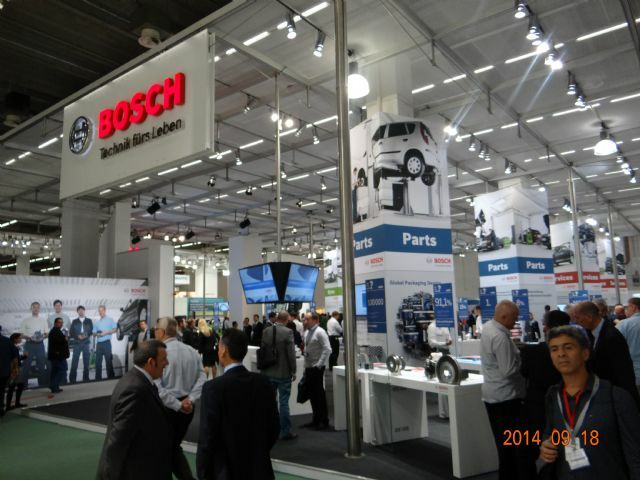 Bosch was also distinctively featured, besides its 2,300-square-meter exhibition space, for its designation by the show organizer as one of the 25 exhibitors listed in the 2014 edition's Green Director, with its Bosch Electronic Service, a high-efficiency, eco-driven service targeting professional workshops and garages to have worn parts and faulty electronic components fully repaired and replaced, and optical, dirt and defect removed within 24 hours. 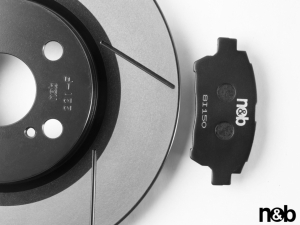 The firm emphasizes that the service is applicable to over 2,000 common electronic components used in ABS, ECU, radio, navigation and other systems, and ensures users high material savings of about 90% and energy and CO2 savings of around 50%, compared to using new parts, to achieve less pollution and better environmental sustainability. Since studies have found that over 40% of vehicle breakdowns are caused by battery errors (according to a display at Bosch's booth), battery testing instrument was also sought-after by visitors this year. For instance, the diagnostic system, DBL1200HV, by Deutronic, a German developer of energy systems for various purposes, was nominated for an Automechanika Innovation Award mostly for its outstanding function that allows users to easily condition single battery modules and secure module safety through continuous monitoring and display of various parameters during the conditioning process. Also, the U.S.-headquartered Midtronics, a battery management solution provider, was a candidate for the Automechanika Innovation Award 2014 in the Repair & Maintenance category, with its DSS-7000 Battery Diagnostic Service System featuring full battery service management with VIN (vehicle identification number)-driven testing and integration with the firm's Midtronics Battery Management System and being applicable to all sophisticated batteries and vehicle systems available. Bosch occupies nearly half of Hall 9.0 to present thorough solutions for car repairs and services. Application of cloud in vehicle diagnostics is also a notable emerging trend in the market, and the Cloud Diagnostics+ by Autoaid, a German developer of cloud-based diagnostic systems, provided a striking example. The technology works with any smartphones, tablets and PCs and connect those to Autoaid's Cloud Diagnostics+ Server through UMTS (Universal Mobile Telecommunications Service) or WiFi. And then, diagnostic results are recorded and analyzed on the server during each vehicle scanning to predict accurate repair situations that are shared with all users. This technology allows users to obviate needs for other software installations to help greatly cut operating costs. 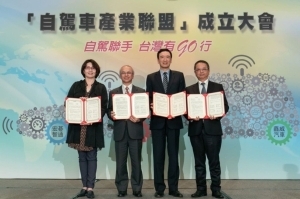 Taiwan has been a top-five participating country in Automechanika Frankfurt for years, mostly due to their consistent focus on R&D to develop innovative products and services that meet global buyers' requirements for market-leading quality and performance. 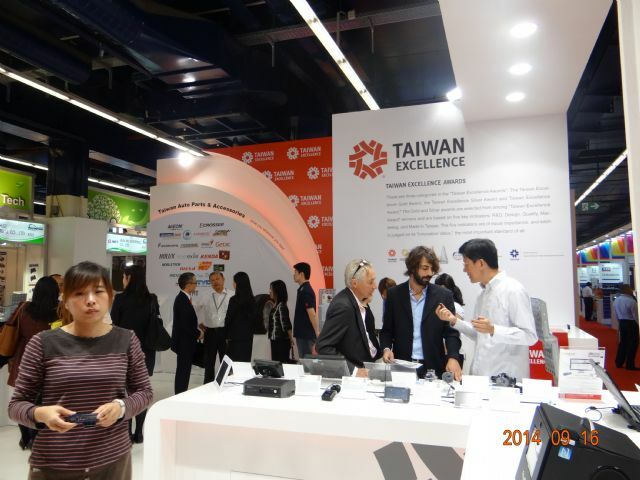 This year was no different with exhibitors' products in the Taiwan Excellence Pavilion in the Hall 4.2. Set up by the Taiwan External Trade Development Council (TAITRA), a semi-official export promoter, the pavilion highlighted wide-ranging products with officially approved quality and functionality from the island's high-profile manufacturers, which ranged from Box PCs, in-vehicle embedded controllers, in-vehicle surveillance with fleet management computing boxes, all-in-one mobile data terminals, intellectual mirrors, full LED tail lamps, and OE replacement TPMS (tire pressure monitoring system), to digital torque wrenches, tires, rugged laptops, automobile navigators, air impact wrenches, ratchet wrenches, cameras, to high-power IC regulators, side airbag inflators, tie-downs, digital torque adaptors, on-the-go USB flash drives and solid state drives. Taiwan Excellence Pavilion draws continuous influx of visitors. The UltraDV (UDV-888) developed by Cansonic Inc., a leading branded supplier of car video recorders, commanded ample attention among foreign visitors interested in Taiwan's globally recognized manufacturing and R&D capabilities. 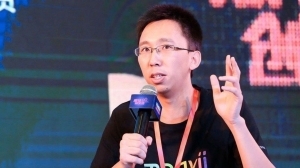 The firm's CEO, Dr. Joe Hsu, said that the UltraDV is more than a car DVR (digital video recorder), mainly because its various features and functions, including full-HD 1080P image capture, WDR (wide dynamic range) function, time-lapse function, built-in G-sensors and parking collision detection, 140-degree wide angle lens with F-number of 1.6, very compact at only 5.7X5X4.2cm, built-in 1.5-inch high resolution panel, 4X zoom in/out, and a built-in stereo microphone and speaker. The device can be even beefed-up with the firm's exclusive APP, compatible with both iOS and Android, to allow interoperability and video streaming with smartphones via WiFi to work as home surveillance cam and baby monitor. Further, Hsu mentioned, the waterproof case and optional accessories, including a body-strap mount, tripod mount, buckle mount, stick mount and wrist housing, make the product versatile for cycling, mountain climbing, swimming and other sport and leisure activities. Other noteworthy products were the DrivePro 200 Vehicle Video Camera from Transcend Information Inc.; GPS-supported Onboard PC from Advantech Corporation; high-speed car tires from Kenda Rubber Ind. Co., Ltd.; and 2-DIN in-dash Head Unit RV-5500 by Royaltek Co., Ltd. The four products were introduced by company directors at a public event organized by TAITRA in the Hall 4.C, where foreign media and Agnes Chen, embassy of Taiwan in Germany, were present. The DrivePro 200 is designed for continuous recording of frontal activities of vehicle with an ultra wide angle lens of 160 degrees, and can be mounted to rearview mirror or dashboard. The product features CMOS 3-megapixel sensor to record videos with bright, clear images in either HD or full HD format, and built-in WiFi function supported by the DrivePro 200 app to enable connectivity with iPhone, iPad and Android-powered devices. Trenscend's general manager, George Linardatos also mentioned the firm's on-the-go flash drive for Android devices. Sayed Maudodi, product and sales manager of Advantech, introduced the on-board PC (TREK-674) featuring real-time communication between driver and headquarters and GPS linkage, being ideal for buses, ambulances, garbage trucks and other vehicle fleets subject to remote monitoring and management. With those features, the device helps not just to increase safety, but also reduce operating costs by monitoring and evaluating routine data along routes. 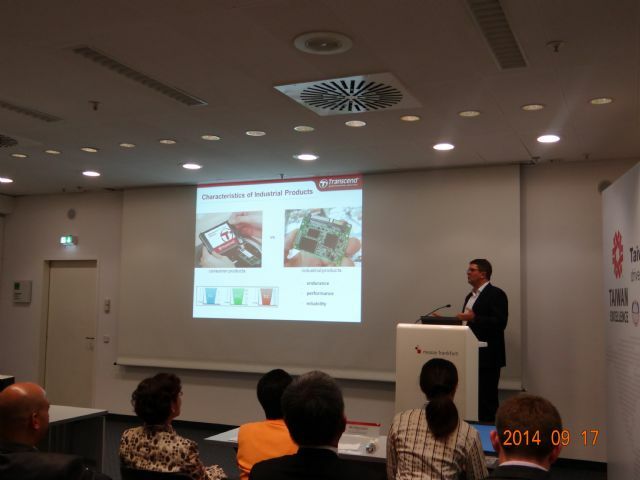 Presentations for winners of Taiwan Excellence Award in Hall 4.C on the second day. Kenda's high-speed car tires, KR 30 Vezda Eco and KR 26 Vezda, available in 15 and 16 inches, are both approved for speed ratings of H to 210 km/h and V to 240 km/h, with the innovative silica infused tread helping reduce rolling resistance and increase mileage to over 50,000 kilometers. The KR 30 Vezda is an all-season tire with cornering stability, with its innovatively designed tread tested to cut fuel consumption up to 3% and carbon emission by 30-40 grams per kilogram. The KR 26 Vezda, a summer tire, has four outside ribs of special stiffness to ensure excellent handling and high cornering stability, and specially designed angles to prevent uneven abrasion. With the two new products and other high-performance tires, Kenda's marketing manager in Europe, Michael Andre, stressed the company will speed exploring the European market to boost its presence in the global tire markets, after having become the world's second-largest bicycle tire branded vendor. The RV-5500 head unit, said Royaltek's president, Jacky Chen, allows communication with and data sharing from other mobile devices to serve not just as in-car navigational, but also an infotainment system. Besides, the USB and HDMI terminals are designed for recharging batteries of smartphones connected to the device via cables during driving, and the handsets can be also linked to the infotainment system through Bluetooth. The Android-powered head unit is also noted for its voice control, the FM board radio and the built-in Internet TC module. 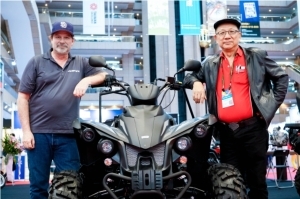 This year's Automechanika Frankfurt again arranged various support, educational events for visitors to be updated on the latest market trends and innovations. At the opening ceremony, the organizer honored five winners of the Innovation Awards in six categories: Pannex AG with Pannex tire sealant; TEXA S.p.A with TEXA TMD MK3; Car-O-Liner AB with Vision 2; Industrie Saleri Italo S.p.A. with Modular Pump; Continental Aftermarket GmbH with VDO REDI-Sensor; TEXA S.p.A. with Augmented Reality Glasses by Texa; and MAHA Maschinenbau Haldenwang GmbH & Co., KG with MFP 3000 MAHA Driving Assistance Tester. All the winning products were specially displayed in the the passageway linking Hall 4 and Hall 6. Award-winning products of the Innovation Award at a special area along the passageway in Hall 4. Seminars, panel discussions and academic programs were also held, including the Programme of “Dose Steel Have a Future in Automobile Manufacturing,” the BVL Forum with a topic of “Complexity in the aftermarket – logistical challenges,” the Collision Damage Talk and Networking. 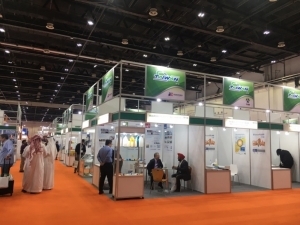 The Green Directory, compiled by the organizer, enables visitors to conduc t easy sourcing of products and services that are developed by suppliers concerned with environmental protection and sustainable use of resources. This year's Green Directory listed 25 exhibitors, including Bosch, Valeo, Pannex AG, Festool Group GmbH & Co., KG and GPS Service GmbH & Co., KG. 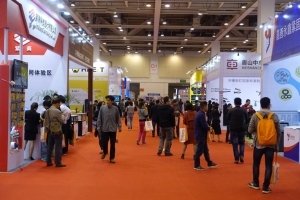 For decades CENS has been promoting Taiwanese auto parts and repair tools at the show by organizing exhibitor groups, circulating its buyer guides, including the Taiwan Transportation Equipment Guide (TTG) and the Guidebook to Taiwan Hand Tools, hence well recognized by both Taiwanese firms and foreign buyers. CENS's TTG is particularly trusted by foreign buyers of auto parts worldwide. 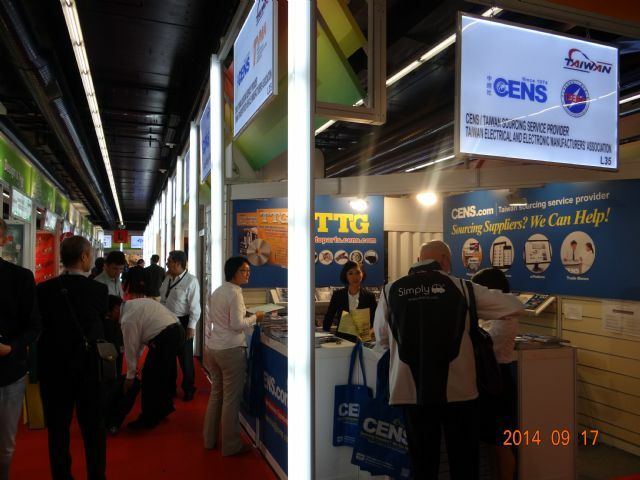 CENS again heads Taiwan’s largest exhibitor group. 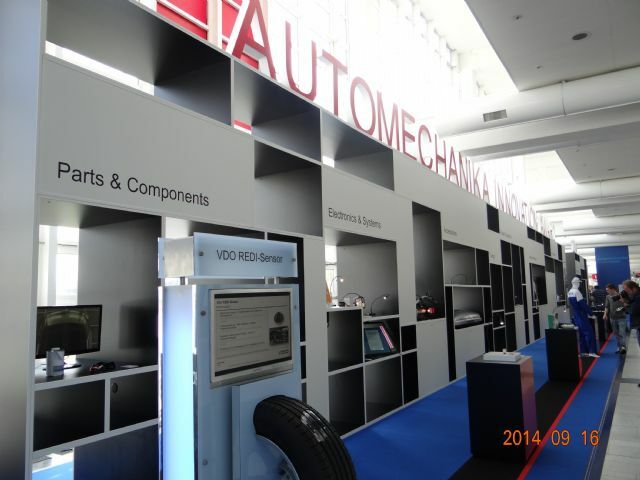 Again CENS organized Taiwan's biggest exhibitor group of 230 Taiwanese companies to the 2014 Automechanika Frankfurt, including lots of Taiwan's best-known suppliers of auto parts, such as Tong Yang Industry Co. (car body parts) and Depo Auto Parts Ind. Co., Ltd. (auto headlamps). CENS also manned three booths (L35 and N65 in Hall 4.2 and G20 in Hall 9.2) to not just circulate buyer guides, but also provide buyers with professional services, including arranging on-the-spot meetings with Taiwanese exhibitors and real-time business matchmaking. CENS’s booth sees stream of foreign buyers interested in high-profile auto parts and hand tools from the island.